Night falls. Jeremy speaks with Aelita, Odd rehearses a musical number for Sissi’s play: Romeo and Juliet… Ulrich believes it’s important he goes to see Yumi and he learns at her house the cause of her problems: her parents are confused after a stupid quarrel and Yumi’s dad has gone to stay with a co-worker… To get them back together Ulrich proposes that Yumi participate in the play and invite each of her parents, telling them the other isn’t coming… To implement this bold plan, he convinces Sissi to give Yumi a role, in exchange for which he will play Romeo. The evil gas divides into four clouds which roam the school with a clear target: the heroes! 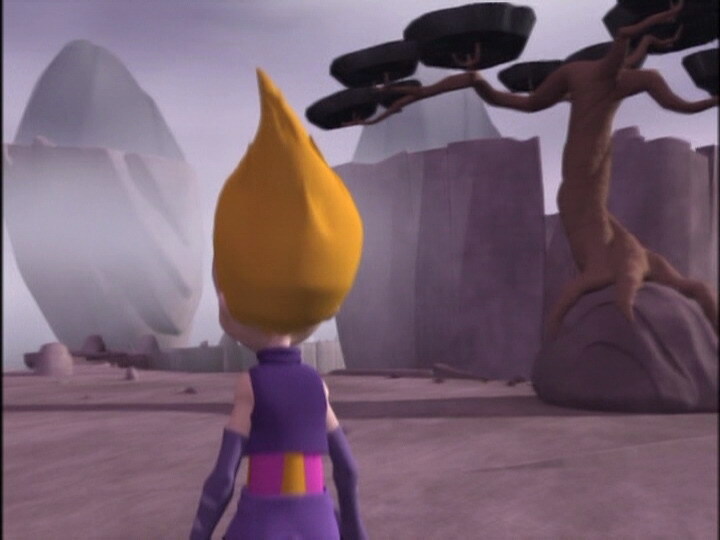 Aelita, wandering on Lyoko, comes face-to-face with Bloks which begin to pursue her… She evades them and enters a tower. The performance approaches. Ulrich and Yumi are preparing in the wings. Left for the factory, Jeremy and Odd want to check if XANA is preparing an attack. Odd is sent to the Mountains and Jeremy launches a Scan. Two gaseous clouds had followed them and since Odd is no longer there, they go after Jeremy, who flees! The gaseous mass follows him relentlessly, and the brainiac throws himself into the sewer water to escape them. The cloud doesn’t dare approach the water but stays on the bank, observing every move Jeremy makes. - Attack: Take control of laughing gas from two cylinders, to suffocate the heroes with laughter. - Return to the past to save Ulrich, Yumi and Jeremy from the laughing gas. - First time Yumi’s parents separate. - Ulrich doesn't like the play Romeo and Juliet. - Jeremy knows how to pick locks. - Nicolas wrote the script for the performance of Romeo and Juliet, he thinks Ulrich massacred his script and that Herb was better than him. - Odd once again displays his talent as a musician and plays the acoustic guitar for the play. - Reappearance of Mr Delmas’ formalwear. - The halo of the tower Aelita is in disappears in one shot. 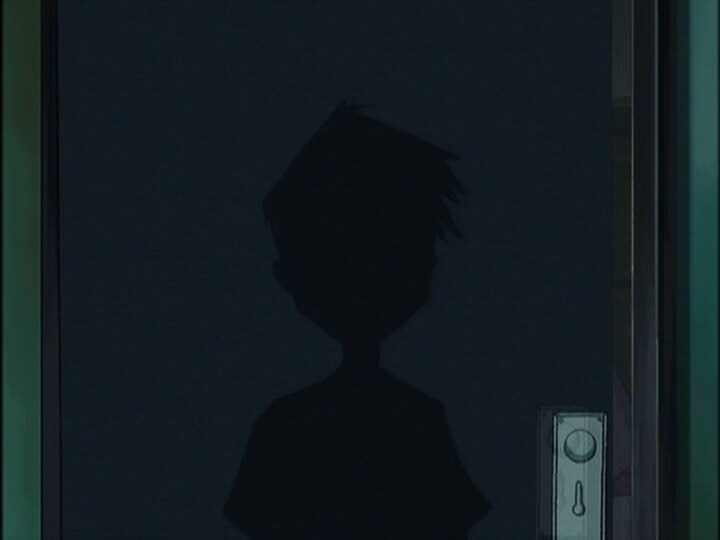 - The keyboard and mouse of Jeremy’s computer are absent when he talks with Aelita. - The principal's moustache and eyebrows are grey when he shakes the hand of a woman. 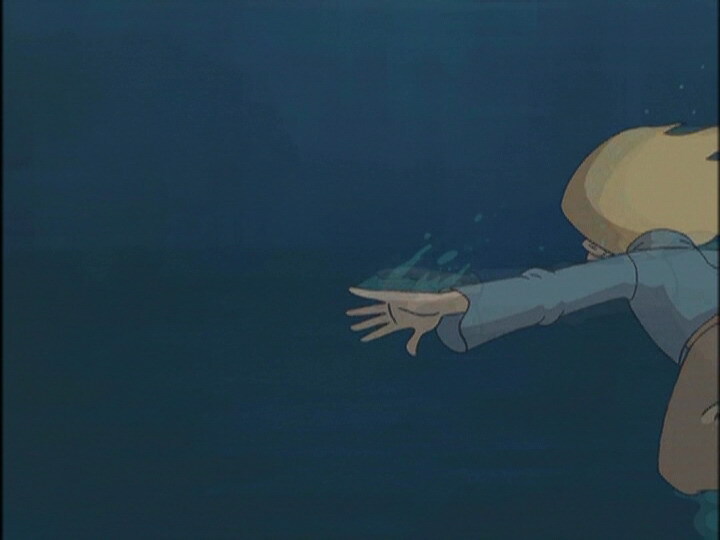 - The marks under Nicolas’ eyes are absent when he says that Herb made a better Romeo than Ulrich. - The cylinders of N2O change from one scene to another and they change appearance when Jeremy touches them. - Herb’s hair is entirely black when he complains about Ulrich taking his role and until he tells him that he wants to slug him. - The colours of Odd’s pants are inversed before Ulrich says that Yumi is sulking, before falling from the chair, and after falling from the chair they become entirely the one shade of purple, then the colours are inversed again when he enters the scanner. - Emilie and Ulrich’s places are reversed when Odd talks about a laughing fit then appendicitis, we also see Mohamed Kantaoui and Tristan Brossard of year 7, and after Ms Hertz drinks the water, Ulrich changes place again. 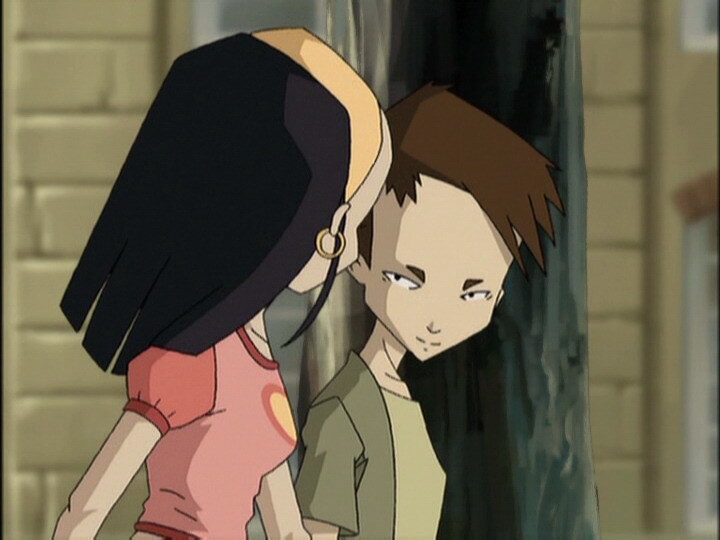 - The factory microphone is in Jeremy’s right ear when he wants to connect to Aelita, when Odd decides to join her. 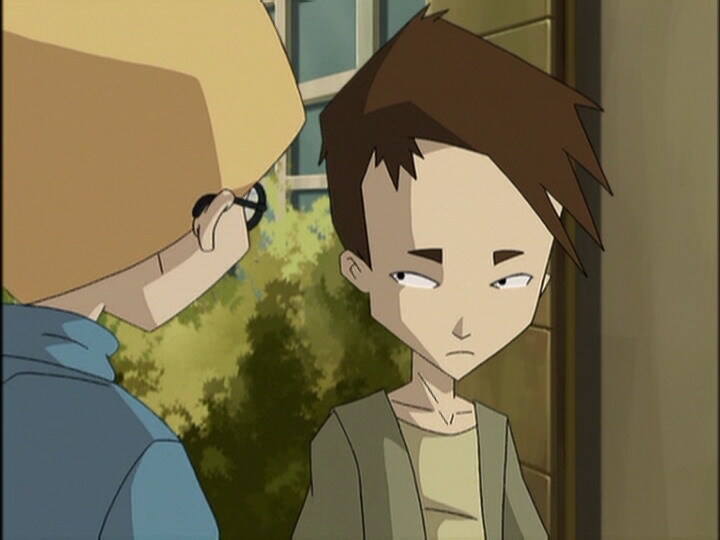 It disappears from his left ear when Odd goes to the scanner room and when he selects Odd’s character card, then it disappears from the keyboard before the computer says Odd’s virtual envelope is damaged. - First appearance of the Romeo and Juliet set, seen again in episode 60 “Temporary Insanity” for the play Cyrano de Bergerac. - First tower activated in the Mountains. - Fourth and final Future Flash. - Only episode in which Jeremy winks at the audience and in which we discover a labyrinth in the Mountains. - Nitrous oxide is a gas which exists in the formula N2O. However, the gas is not at all exciting and is widely used to relax patients. Dentists use it a lot for anxious patients. Inhalation is indeed dangerous in high doses! This relaxing gas can provoke a slight chuckle but there have been no recorded cases of a laughing fit like what happened to the heroes. - The play Sissi stars in is none other than the famous play by Shakespeare: Romeo and Juliet. The two characters are known worldwide for their tragic love story. Julia Roberts is an American actress well known for her beauty. Jeremy: I’ve never seen her laugh so much. Odd: You’re telling me, I’ve never seen her laugh at all! Odd: Not a bad idea! Nothing like a laughing attack after an appendix attack! Ulrich: I’m not saying you don’t have a good sense of humour, Odd, but I’d rather go and talk to her. Jeremy: You think that Ulrich will manage to get her to smile? Odd: Yeah, sure as Julia Roberts is going to call and invite me to out dinner. 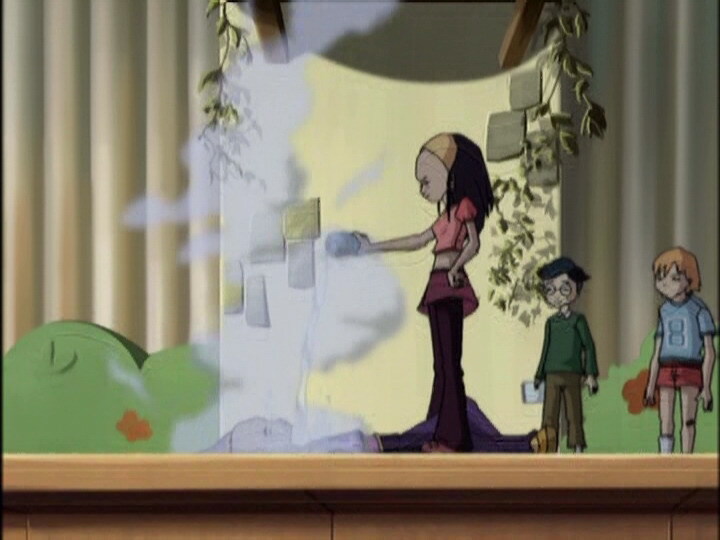 Yumi: Ugh, please, Ulrich…leave me alone, I really don’t feel like talking. Ulrich: But I feel like talking, and with you! 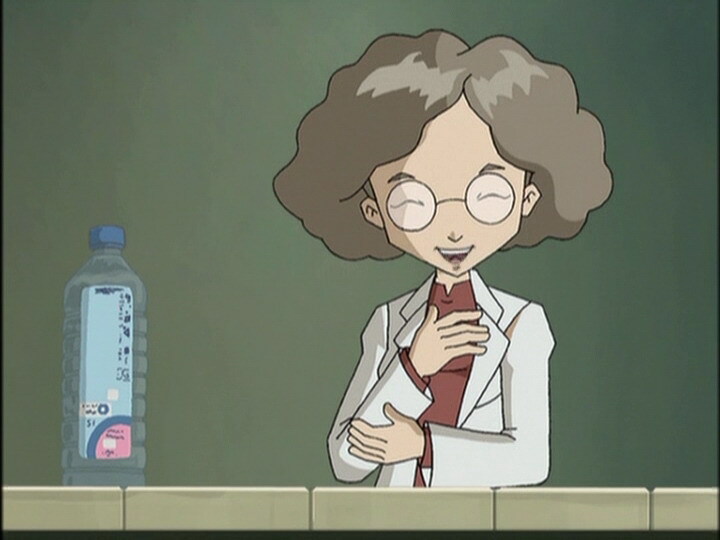 Yumi: If you like talking so much, talk to yourself, ok? Sissi: Don’t worry, Ulrich, not all girls are like Yumi! Ulrich: Yeah, that’s a shame! Sissi: Are you coming tomorrow, to the rehearsal? Huh? Ulrich: Yeah, I’ll be there. But it’s not for you, it’s for Odd. Ulrich: And I suppose that you, of course, are Juliet? Sissi: Yes, that’s perfect casting, don’t you think? Ulrich: Well it’s a perfect reason for me not to play Romeo. 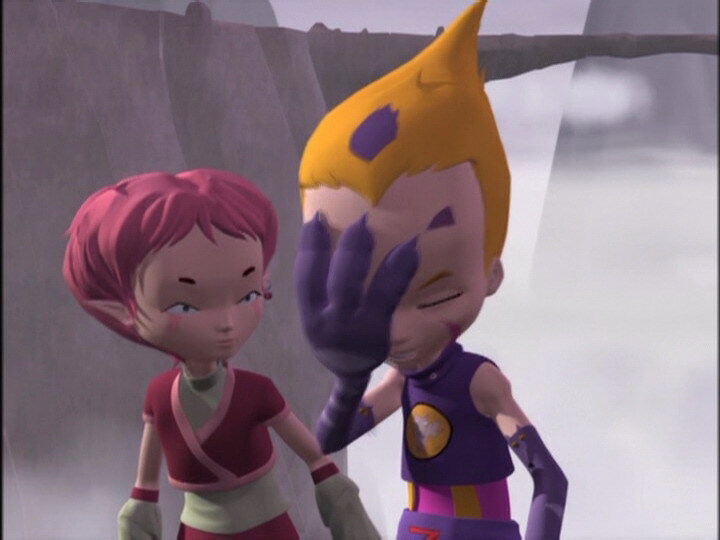 Aelita: It’s strange that they’re mad at each other, Yumi and Ulrich always get along so well! 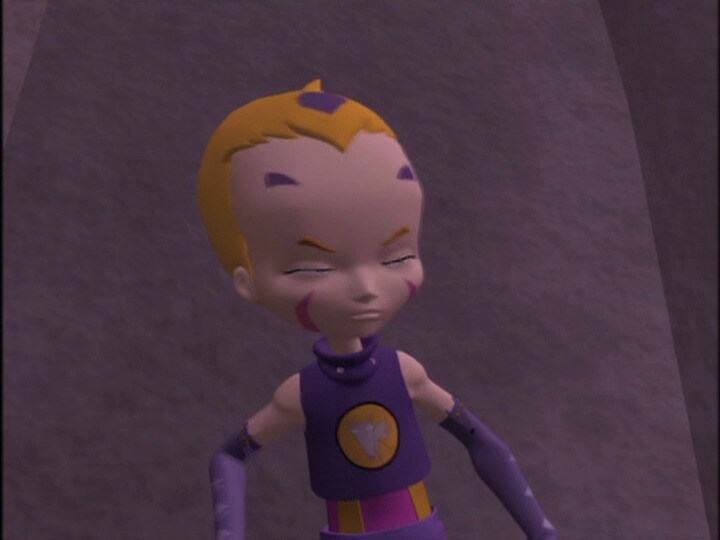 Jeremy: Well, you know, Aelita, very often people who get along well have fights. 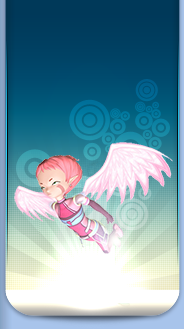 Aelita: Really? What about you and I? Why don’t we ever fight? Jeremy: You and I? W-well, I dunno, really…I uh…anyway, I uh…XANA’s been quiet lately! Too quiet, don’t you think? Jeremy: Don’t worry! The only one of us who’s in any real danger today is Odd, he’s rehearsing with Sissi. Now that’s what I call a risk! 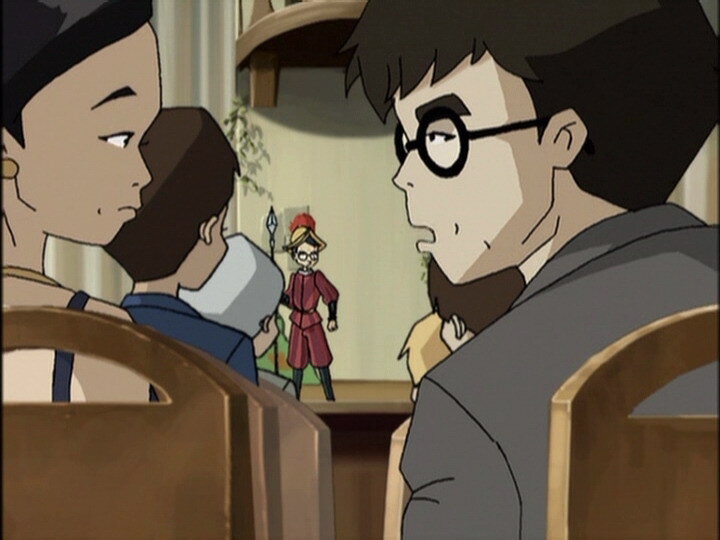 Herb: I don’t know if she’ll appear…tonight…but, uh…(he brings the script right up to his nose) let’s see here…oh! I know she loves me! Mhm? Sissi: That’s awful! It’s about as flat as a pancake! Sissi: And Odd, you’re playing much too fast! Odd: Sure! If I play a little slower it’ll give me more than enough time to take a little nap! Sissi: Hey, keep all your bad jokes for yourself, huh?! Sissi: And why would I want to give Yumi a part? Ulrich: Forget that I even asked. Goodbye. 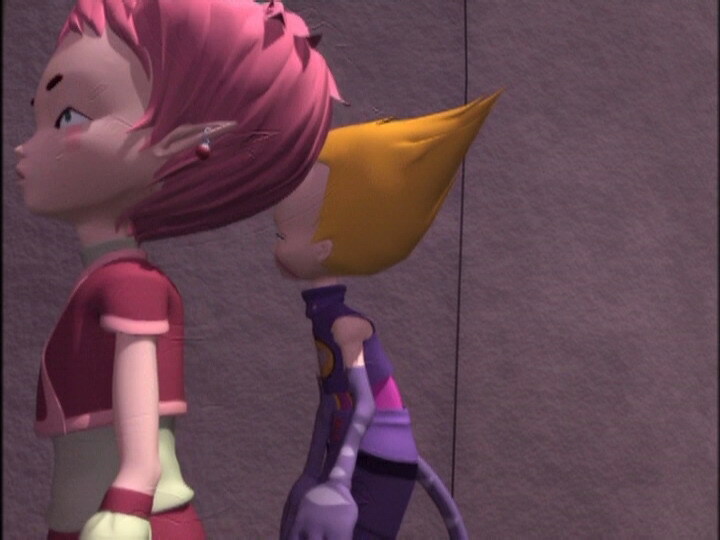 Jeremy: Aelita and me, we never fight. You think that’s normal? Odd: Huh? Yeah, no…how do I know? Jeremy: You think we’d fight if she lived here in our world? Odd: I think we’re gonna get caught if you don’t hurry up! Jeremy: Guess we ran out of gas, if you pardon the expression! Sissi: You’ll see, you’ll make a perfect Romeo! Ulrich (to Yumi): Hey, I’m doing it for you! Herb: I wonder why I don’t just slug you! Ulrich: Ha, adults can be such children sometimes, huh? Odd: This is not a good time to desert me, Jeremy! The welcoming committee looks really mean and I’m not feeling too good! Jeremy? …things don’t look so good! Principal: Good evening. I suppose your husband is meeting you here tonight? Mrs Ishiyama: Uh…no, my husband isn’t able to come. He’s uh…not feeling well! Principal: Oh, Mr Ishiyama! I’m delighted to see that you’re feeling better already! Odd: I’m too weak to fight them, I’ll have to trick them! Jeremy (to himself): Well, Jeremy, how do you want to die? Freezing or laughing? Nicolas: This is awful! He’s massacring my text, huh! Even you were better! Sissi: What’s the matter know? What happened? Why are you all laughing?! You don’t understand drama! This is not a comedy, it’s a great tragedy!